If your loved one has been wrongfully killed, please visit our “wrongful death” page for advice. A 56-year-old man was killed in the Metro-Link disaster in Los Angeles, where the train crashed due to the inattention of a conductor while “texting”. A middle-aged woman who was riding her bicycle to work in Fremont, Ca was killed by a tractor-trailer. Her two adult children were compensated for her wrongful death. 56 year old man was killed in a head-on collision on Highway 152/Pacheco Pass by another driver under the influence of methamphetamines. The family was successful in their lawsuit against CalTrans, alleging that CalTrans was responsible for failing to install a median barrier which would have prevented the collision. Verdict against the City of Santa Cruz for the family of a man killed when a group of panicked horses collided with his truck on the freeway. The city failed to adequately secure a gate which allowed the horses to get free. A 56 year-old truck driver was killed on an Interstate in Arizona when an eighteen-wheel truck traveling in the opposite direction crossed the center median causing a head-on collision between two trucks traveling 70 mph. All three occupants of both trucks were instantly killed. The wife and three adult children brought a wrongful death action against the trucking company who employed the trucker who crossed the median barrier. 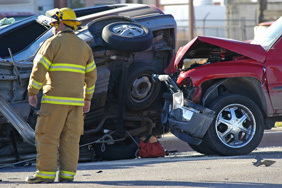 The accident occurred in Arizona and lawsuit was brought in Federal Court in Phoenix Arizona. Settlement for the surviving adult children of a man killed in an airplane crash in San Jose, California. The pilot had failed to perform an adequate pre-check of the plane which would have revealed a defect in a major component. Settlement for the family of a woman killed in an auto/truck accident on Highway 101 in Monterey County, California. Settlement for the surviving spouse in an automotive design defect case against General Motors involving a defectively designed fuel tank. General Motors negligently designed their trucks by placing the fuel tank outside the main frame of the truck.